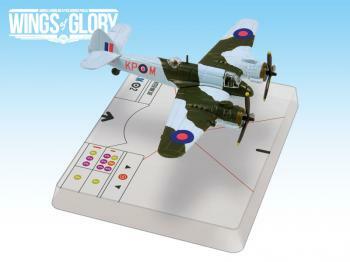 Each WWII Wings of Glory Airplane Pack is a ready-to-play model, painted and assembled, 100% compatible with any other WWII Wings of Glory game product. In each pack you will find all you need to play with the airplane, a special base with gaming stats, a variable altitude flying stand, and a specific deck of manoeuvre cards. This edition of the Bristol Beaufighter is the Mk VIF and truly armed to the gunnels and the teeth whilst it is at it! Davoud's Beaufighter possesses additional capability over the other Bristol Beaufighters in Wings of Glory and features a tail gunner and cannon armament firing forwards. Other than the D-Token distributors available (Ki-61 KIAD and Me Bf 109K) this aircraft has the reputation of being the most formidable participant in the game and I have had more than my fair share of Messerschmitt Bf 109s and 110s utterly chomped by this when I have faced this aircraft in anger. As the only Beaufighter to feature a tailgunner firing rearwards there is every reason for opponents to fear this aircraft most of all and if you are able to obtain one I would just go for it. As an early release from Ares Games for WGS (World War 2 versions of the game and Wings of War only) all three Beaufighters are now becoming quite scarce although they are still listed as current on the Ares Games website. Before putting this into a game I would recommend taking this miniature for a Solo Play spin which the game and it's amazing playability characteristics can accommodate very well. Get to know what this could mean for your opponents before this sends them running for cover! Sure fire 10 out of 10.